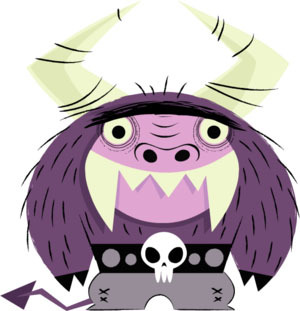 Eduardo is a character from Foster's Home for Imaginary Friends. The title explains the concept well: a group home for entities dreamed into existence by children but later discarded when the child outgrows the need for imaginary friends, or for a variety of other reasons. Eduardo looks like a mutant biker minotaur, but the character is timid and childlike. My aim was to copy the character model as closely as possible. I left off the tail and the little hairs on top of the head because I thought they wouldn't survive the kiln (and the perilous stage of being handled by various volunteer before being placed in the kiln). I thought the pinkish color of Eduardo's face could be described as lavender, but apparently lavender is more of a bluish color.